For the first time in Season 2, it’s everybody’s our mom’s favorite guest host… Cory Williams! Another tight one heading into Final. For those of you interested in The Penultimate Wager, here’s a video I put together looking at Shawn’s options. Shawn should wager 9,200 to cover Sam. 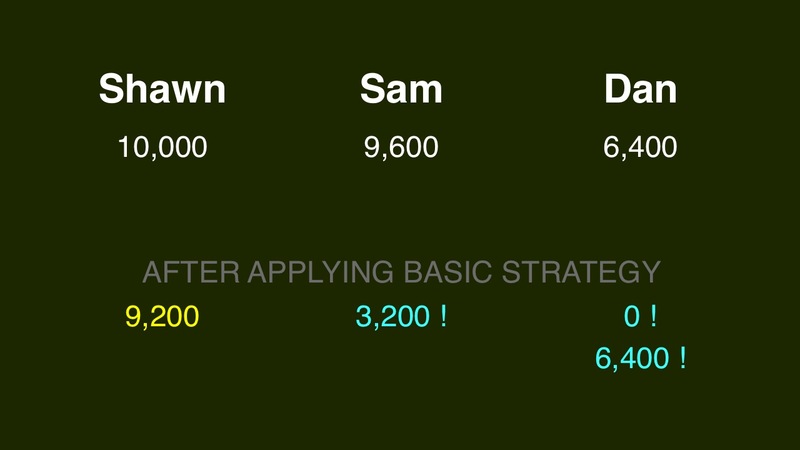 Sam can wager up to 8,800 to stay above Shawn if they’re both wrong. Dan can wager up to 5,600 to stay above Shawn should they both miss. Sam should wager exactly 3,200 to cover Dan. Dan can wager zero or, if he thinks Sam will wager properly, he can wager everything. 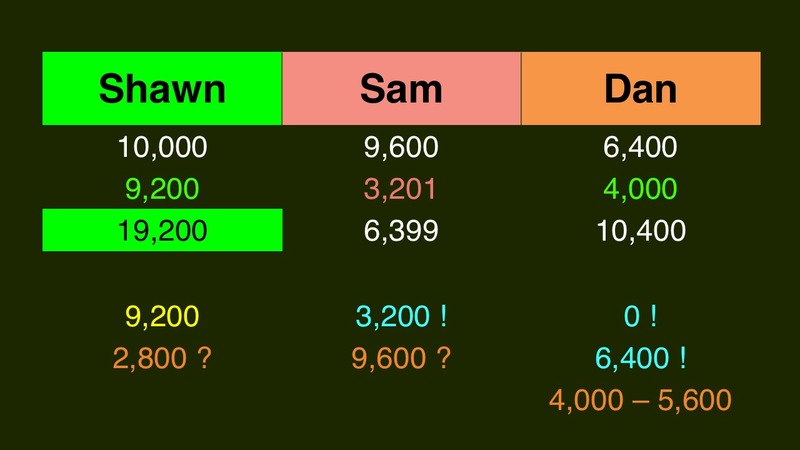 The reason: Dan has exactly 2/3 of Sam’s score. If Shawn thinks the other two players will play rationally, he can go for 2,800 and the three-way tie. I don’t really like this, but whatever. Dan might also cover the “safe” 400 wager out of Shawn and go for at least 4,000 (but no more than 5,600). There’s a little more flexibility here since Sam’s move isn’t set in stone. 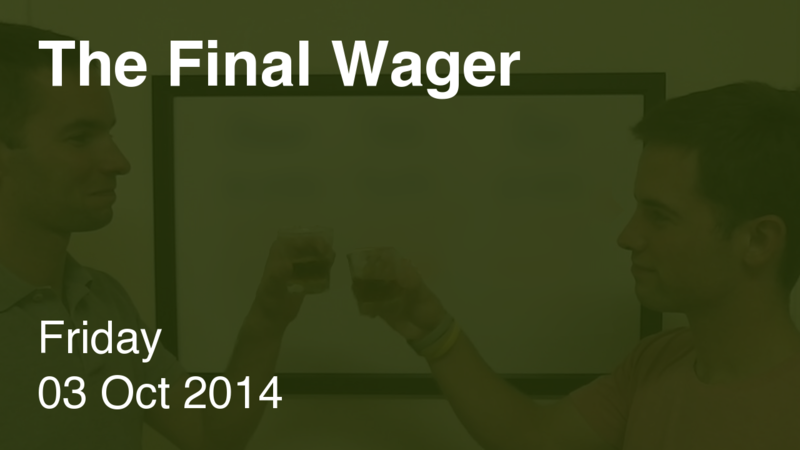 Another wager to tie, and Sam didn’t want to try to take advantage. Instead, he tacks on the (extremely risky!) extra dollar. What is How I Met Your Mother? Always loved when Cory comes on, he makes a very interesting guest host! Cory IS everybody’s favorite host. Also, if I’m ever in New York I want to come on and criticize any wagers that aren’t $4000. We should run a Kickstarter campaign to get you on here! One thing that should be noted about the penultimate wager is that there was still a 400 dollar clue left on the board. It ended up going unrevealed, but at the time of the decision I don’t think they could have known that, so it would affect the math somewhat. Having said that, I really like going for the win right there. Historically, a random FJ question is significantly harder than a random $1600 DD, about 63% vs 50%, so all you’re doing by wagering smaller is postponing the moment of truth for a few minutes at the cost of having to answer what is likely to be a more difficult question. It worked out this time, but as they say, hindsight is always 20/20, I still think going big on the DD would have been the right play. That’s true – there was a $400 clue on the board. But Alex had called a minute to go so long prior that there was no doubt in my mind they wouldn’t hit it… in fact, I was somewhat surprised they got to the DD! Of course, whether a question in a known category is “more difficult” than a random FJ question is in the eye of the beholder. While true in many cases that’s true, I’d say ‘The 20th Century’ is about as generic as Jeopardy categories get, I doubt too many contestants should have strong feelings one way or the other. It’s just typical misplaced risk aversion that you see all the time, not just on Jeopardy (see: 95% of football coaches in the world). Agreed – a lot of players are unwilling to put the game out of reach if it might put them in a bad position heading into Final, even if it’s a slam-dunk category. If Shawn goes “small” to preserve the lead, he ought not go for the full 1,000 because in that case if he’s wrong it would render the exact 2/3 relationship between his opponents moot. Since Dan has a possibility of betting it all by virtue of being the trailer in the exact 2/3 scenario, and Sam has an incentive as well since Shawn has bet for the tie before, it’d probably be in Shawn’s best interests to maintain an outright lead if he went that way – even if it’s just by a dollar (since the tie would pretty much make his only rational wager all-in, giving him zero chance of winning if wrong even if both of his opponents bet it all and miss too*). *Interestingly if this were a semifinal or other non-wildcard match in a tournament, under the new rules were a tie at zero is treated like a tie at any other amount (with the ensuing tiebreaker) then it’d be different. Also, I especially like the 7,400 possibility since if he’s right he’s got a crush with Dan too distant to be a factor, but if he’s wrong then we have a unique situation that is the convergence of the exact 2/3 and first-equals-second-plus-third scenarios: A perfect 3:2:1 ratio of the scores (which is better than a usual A=B+C situation because second has an incentive to bet zero which opens another door to winning besides the usual sole solver in this case).